WILLEMSTAD - The police are setting up traffic checkpoints again. Last Sunday they were on the Road to West Point where they stopped 138 cars. 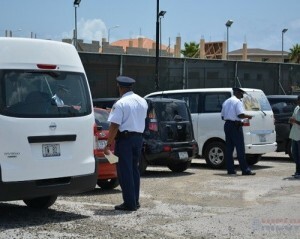 29 drivers were fined because they did not have their papers in order. Nine drivers were fined because they did not have their seatbelts one, and one car had no brake lights. One of the cars was not allowed to continue further and was taken to the police station with a towing car. The police will continue with these traffic checkpoints and warn drivers to have their documents in order.